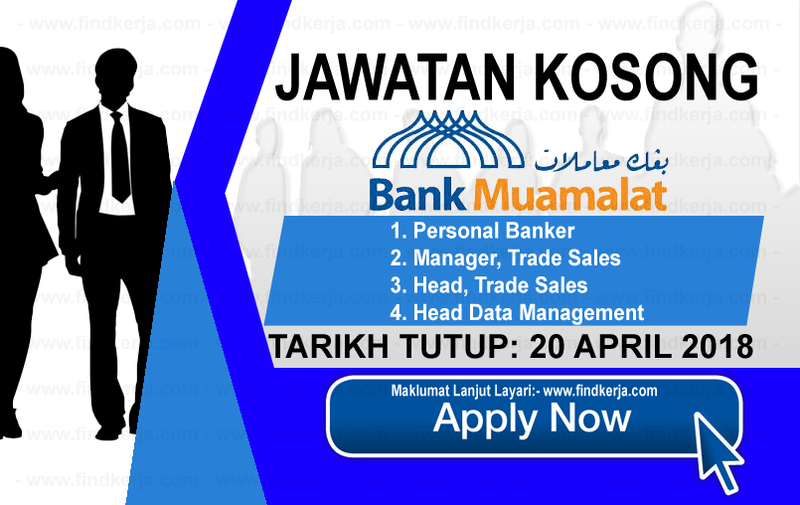 Bank Muamalat Malaysia Berhad (Jawi: بڠك معاملة مليسيا) started its operations on 1 October 1999 with a combined assets and liabilities brought over from the Islamic banking windows of the then Bank Bumiputra Malaysia Berhad, Bank of Commerce (M) Berhad and BBMB Kewangan. Bank Muamalat Malaysia Berhad, the second full-fledged Islamic bank to be established in Malaysia after Bank Islam Malaysia Berhad, is poised to play its role in providing Islamic banking products and services to Malaysians, without regard to race or religious beliefs. DRB-HICOM holds 70% shares in the Bank while Khazanah Nasional Berhad holds the remaining shares. Terima Kasih Kerana Membaca Dan Menyemak Kerja Kosong Bank Muamalat Malaysia (20 April 2018) Selamat Memohon Dan Semoga Berjaya Kami Ucapkan, Sila LIKE Facebook Page Kami Dan Kongsikan Kepada Semua.